I’m making petals that will surround the boy inside a flower pot. The idea came from a short story I wrote a few years ago in which a woman, Lilley, dies and her essence is contained within a flower immediately after in an afterlife. The flower petals open and Lilley’s essence becomes a point of light which arises from the flower and zips about with loads of other points of light. I’m imagining that I will place the boy puppet inside the flower pot and close the petals and then he will come to life when the petals open. 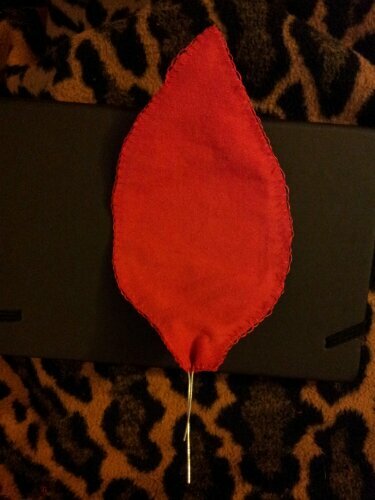 I made the petals using bits of an old t-shirt sewn together with a petal shaped wire inserted and sewn into them. This entry was posted in sound and vision and tagged making animation props, sound and vision by Julia Fry. Bookmark the permalink.